Besides volunteering and sharing your art and ideas you can support CommunityArtShare with a donation. The funds are used to grow and sustain CommunityArtShare which is supporting artists in our community. CommunityArtShare produces events such as art gallery openings, release parties, concerts, yoga/meditation classes and various educational workshops to help promote artists, strengthen our community and increase sustainable practices. 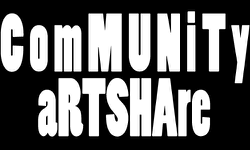 As CommunityArtShare grows we will be pleased to offer incentives such as trinkets, t-shirts, stickers, posters, art pieces, business promotion and the like for your donations. If you would like to give in an amount that is not shown please contact us.